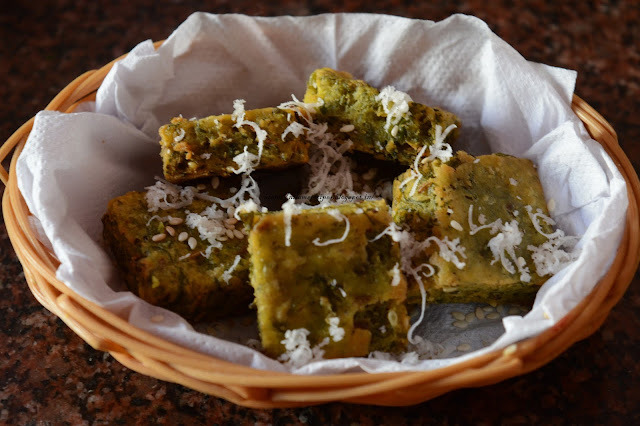 Dhirde is a traditional Maharashtrian snacks dish. It is a Marathi name for ‘dosa’. Mugache dhirde is made form green moong and urad dal for snacks. It is a simple and speedy preparation. It is like dosa but is fluffy and soft. Excellent source of proteins and is light on stomach. Amazing taste and beautiful texture. Savoured by people from all ages and classes. This dhirde is easy to make at home so you don’t need a restaurant nearby. Make yours now with this pictorial mugache dhirde recipe. Total Time: 7 hours and 25 minutes. Soak green moong dal and urad dal overnight. Next day morning drain and add green chilies, garlic cloves, coriander leaves and grind it to fine paste. Add little water and prepare a batter. The consistency of a batter should be like dosa. Add salt and stir it. Heat non stick tava on medium low flame and grace tava with little oil. Pour a spoonful of batter on it. Keep a lid on it and let it cook for few minutes. Remove lid and flip it and cook from another side. 1) You can also use whole green moong instead of split dal. 2) If You are using green moong than sprout it before using. 1) Soak green moong dal and urad dal overnight. 2) Next day morning drain and add green chilies, garlic cloves, coriander leaves and grind it to fine paste. 3) Add little water and prepare a batter. The consistency of a batter should be like dosa. Do not add more water. 4) Heat non stick tava on medium low flame and grace tava with little oil. Spread with spoon. Keep a lid on it and let it cook for few minutes. 5) Remove lid and flip it and cook from another side. 6) Serve hot with green chutney or tomato sauce.